IMPORTANT NOTE: in order for our team to provide a more efficient and streamlined set of products, we have made the decision to discontinue developing these desktop versions. Please be assured that this decision wasn't taken lightly, but due to the varied server configurations in schools and/or the inability for schools to realistically afford their own in-house IT technicians for day-to-day jobs, we had to take it upon ourselves to detach our products from as much external IT reliance as possible. By making web-based products, we know that this medium removes so much extra 'faff' when it comes to IT hardware and it also enables us to assist in the support and development of an ever evolving system so that it suits the ever changing needs of your school. 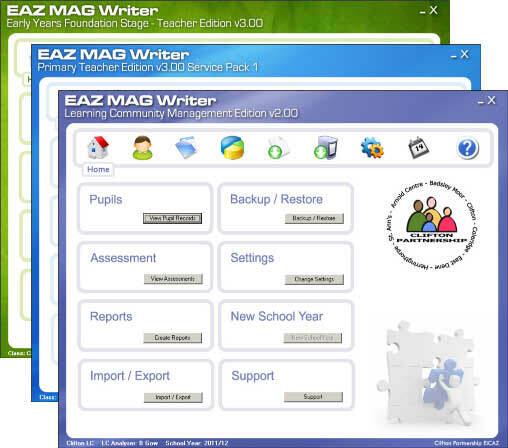 Please see our new EAZ MAG Writer - EYFS, EAZ MAG Writer - Primary and EAZ MAG Writer - Learning Community products for further details.